Mr. Kim Jong Un, tear down these nukes! 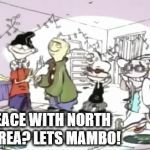 PEACE WITH NORTH KOREA? LETS MAMBO!